After the Ludicrous Lusitania, I think it is time to look at yet another Peculiar Plot of the early 20th century, the contemporaneous incredible, miraculous and chilling voyage of Ernest Shackleton to the South Pole. And beyond. Or rather not. This plot is published at Wikipedia in not one, not two, but seven (!) Featured Articles (FA). Mán, they really want this peculiar plot to be carved into the minds of the people. And so it deserves a decent break-down, over multiple posts. Allegedly, British polar explorer Ernest Shackleton (FA #1), sorry Sir Ernest Shackleton, experienced from earlier (supposed?) exploration, set sail for an extreme expedition; with a group of hardened men his plan was to cross Antarctica and be picked up by another crew on the other side and shipped back to civilization. For a nice introduction into miraculous chilling stories, I recommend reading VexMan’s excellent break-down of the Miracle of the Andes, the alleged plane crash in 1972 where Uruguay rugby players were cannibalizing their friends yet chilling in their T-shirts on the slopes of a snowy Andean mountain at the border of Argentina and Chile. Indeed, Zal Rule material, the movie Alive (1993), produced by The Kennedy/Marshall Company is famous. Back to Ernie and his crew. The Imperial Trans-Atlantic Expedition (FA #2) was the last major expedition of the Heroic Age of Antarctic Exploration. The plan was to start in Buenos Aires (where Shackleton boarded the ship coming from Plymouth, UK), sail to Grytviken in South Georgia and the Sandwich Islands (which they supposedly did in 10 days) and from there across the Weddell Sea to land in Vahsel Bay on the Antarctic mainland. 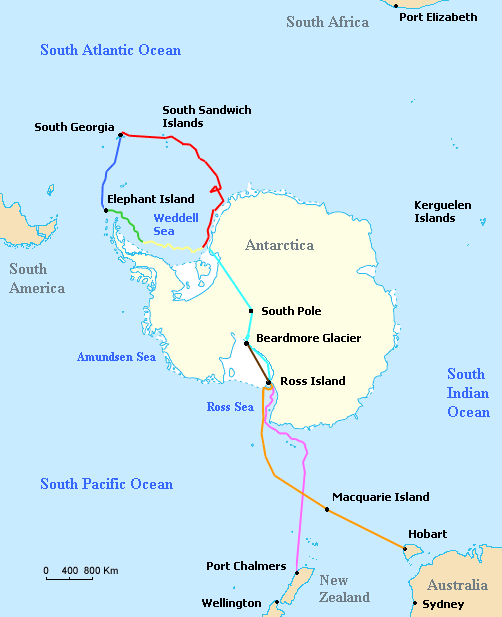 Then an overland crossing would follow all across continental Antarctica, touching the South Pole and ending up at Beardmore Glacier on the opposite end of the continent bordering the Ross Sea. There, another group of explorers, the Ross Sea party (FA #3), led by Aeneas Lionel Acton Mackintosh (FA #4), with Ernest Joyce (FA #5), sailing the SY Aurora (FA #6) that started from Hobart, Tasmania, would meet them and provide them with supplies as they apparently couldn’t carry enough to make the full expedition. Already looking at this map you see how ridiculous this whole plan was from the start on. The most visited part of Antarctica is understandably the Antarctic Peninsula (AP), a relative hop from Ushuaia, Tierra del Fuego, Argentina, the southernmost town in the world. One day I hope to make this awesome travel. According to the story, full of drama and misery already in the planning phase (you can read the article; it is too much to list in this blog post, a small piece will follow), poor Shackleton finally obtained a sailing boat (the Endurance, named after his family motto “By endurance we conquer”) for his journey. He paid 14,000 pounds, though another page says 11,600, equivalent to about 1.2 million US dollars today. This is the age of steamers already (we are talking 2.5 years after Titanic and months before Lusitania), but no, in the area with the strongest winds on the planet, it is apparently better to use sailing boats. The prevailing winds are from the west to the east, another good reason to rather start in Tierra del Fuego and be blown to the AP with ease. Or alternatively in the British Falkland Islands. But no, in this incredible voyage, an experienced polar explorer decides to take the strange route from a place, nothing more than a couple of shacks and tons of blubber from the late whaling age, Grytviken, established just 10 years before. Searches for the original advertisement have proved unsuccessful, and the story is generally regarded as apocryphal. “Apocryphal”, is that fancy Greek for just a lie? The Weddell Sea is, according to the testimony of all who have sailed through its berg-filled waters, the most treacherous and dismal region on Earth. The Ross Sea is relatively peaceful, predictable, and safe. Well done, Ernie, that really seems like the ideal way to start your amazing expedition! It was making for Vahsel Bay, the southernmost explored point of the Weddell Sea at 77° 49′ S, where a shore party was to land and prepare for a transcontinental crossing of Antarctica. Before it could reach its destination the ship was trapped in pack ice, and by 14 February 1915 was held fast, despite prolonged efforts to free her. Hope is pretty useless in the most treacherous place on Earth, and you just have started your incredible journey, Ernie. On 15 January Endurance came abreast of a great glacier, the edge of which formed a bay which appeared a good landing place. However, Shackleton considered it too far north of Vahsel Bay for a landing, “except under pressure of necessity“—a decision he would later regret. On 17 January the ship reached a latitude of 76°27′S, where land was faintly discernible. Shackleton named it Caird Coast, after his principal backer. Bad weather forced the ship to shelter in the lee of a stranded iceberg. You have been shackled by tons of ice for a full month, have land in sight, but you don’t make shore? What is a “necessity” in your log books, Shackleton? Strenuous efforts were made to release her; on 14 February Shackleton ordered men onto the ice with ice-chisels, prickers, saws and picks, to try and force a passage, but the labour proved futile. Shackleton did not at this stage abandon all hope of breaking free, but was now contemplating the “possibility of having to spend a winter in the inhospitable arms of the pack”. On 21 February 1915 Endurance, still held fast, drifted to her most southerly latitude, 76°58′S. Thereafter she began moving with the pack in a northerly direction. On 24 February Shackleton realised that they would be held in the ice throughout the winter, and ordered ship’s routine abandoned. The dogs were taken off board and housed in ice-kennels or “dogloos”, and the ship’s interior was converted to suitable winter quarters for the various groups of men—officers, scientists, engineers, and seamen. A wireless apparatus was rigged, but their location was too remote to receive or transmit signals. No witnesses, apart from the crew in this most remote part of the world, so Ernie can write what he wants in his diaries. The green line on the map is supposed to show this northerly drift of the Endurance after the yellow the initial drift. Shackleton was aware of the recent example of Wilhelm Filchner’s ship, the Deutschland, which had become icebound in the same vicinity three years earlier. After Filchner’s attempts to establish a land base at Vahsel Bay failed, his ship Deutschland was trapped on 6 March 1912, about 200 miles (320 km) off the coast of Coats Land. Six months later, at latitude 63°37′, the ship broke free, then sailed to South Georgia apparently none the worse for its ordeal. Shackleton thought that a similar experience might allow Endurance to make a second attempt to reach Vahsel Bay in the following Antarctic spring. Ah, so you know already of a story by another explorer who failed, why the hell do you think you can make it through the Weddell Sea? Great planning! At the end of March, Shackleton calculated that the ship had travelled a mere 95 miles (153 km) since 19 January. However, as winter set in the speed of the drift increased, and the condition of the surrounding ice changed. On 14 April Shackleton recorded the nearby pack “piling and rafting against the masses of ice”—if the ship was caught in this disturbance “she would be crushed like an eggshell”. In May, as the sun set for the winter months, the ship was at 75°23′S, 42°14′W, still drifting northwards. It would be at least four months before spring brought the chance of an opening of the ice, and there was no certainty that Endurance would break free in time to attempt a return to the Vahsel Bay area. Attempt a return? So the first time it was a failure (Filchner), the second time it was (you, Ernie), but now you think about trying it yet another time? This is insane. The ship was finally crushed by the ice, at its most northerly location right in the Antarctic spring (makes sense, not?) on October 27, and she was crushed by the pack’s pressure, finally sinking on November 21, 1915, almost a year after leaving Grytviken. As his 27-man crew set up camp on the slowly moving ice, Shackleton’s focus shifted to how best to save his party. His first plan was to march across the ice to the nearest land, and try to reach a point that ships were known to visit. The march began, but progress was hampered by the nature of the ice’s surface, later described by Shackleton as “soft, much broken up, open leads intersecting the floes at all angles”. After struggling to make headway over several days, the march was abandoned; the party established “Patience Camp” on a flat ice floe, and waited as the drift carried them further north, towards open water. What an amazing planner, give this man a medal! Oh, wait. From the Endurance, they had managed to salvage three lifeboats, which Shackleton had named after the principal backers of the expedition: Stancomb Wills, Dudley Docker and James Caird. The drama wasn’t over by then, because the ship apparently was crushed by the ice and the whole crew was stuck with the James Caird (FA #7). The party waited until 8 April 1916, when they finally took to the boats as the ice started to break up. Over a perilous period of 7 days they sailed and rowed through stormy seas and dangerous loose ice, to reach the temporary haven of Elephant Island on 15 April. So you are “stuck on the ice” without a ship, only some lifeboats, since November 21 and then you don’t make use of the short Antarctic summer, but WAIT until autumn to start using them? Who writes this crap? Apparently, the camera film and moving picture film reels were just endless, and unharmed by the extreme temperatures and winds…. The true story of Sir Ernest Shackleton’s dramatic exploratory journey to Antarctica aboard the Endurance, during which the ship and all aboard became icebound. Notice how they (legally) are right: it is the story that is true. That doesn’t make the events narrated in that story true. They do it a lot with movies “based on a true story”. Which legally has no repercussions; it doesn’t say “based on truthful events”. I will stop here for now, as the story is far from over, but I will cover more in a next part. Let this peculiar plot sink in, pun intended. Posted on September 19, 2018 September 19, 2018 by gaiasspherePosted in Exploration, History, IconoclastsTagged Antarctica. Just like man never went to the moon, no man ever went to the south pole. I’m not surprised. What do you mean by “south pole”? Antarctica as a whole or just the southernmost point of it? By south pole I mean THE geographic South Pole, approximately the center of Antarctica. I presume that they visited the coast of Antarctica at least – that does not seem very hard to do and is plausible, but traveling to the actual geographic South Pole seems extremely dangerous for that time period and the technology available at the time (e.g., traveling over hundreds of miles of inhospitable and uninhabited snow and ice terrain with no hope of rescue if something wet wrong). I suppose there is the possibility that they never went to Antarctica at all. Remember that what the PTB writes about and is publicized becomes fact and what is interpreted as being “real” in our manufactured world – there is no need to actually do the real work and risk one’s life if one can just write about and said it was so. They may have also gone to the coast of Antarctica or just a little ways inland for the photo ops. Remember that we are talking about delicate and dainty, snowflake, peerage types here, who probably never broke a sweat doing anything at all in their lives – they just had their servants do everything or just bought whatever they wanted using inherited wealth. Yes, I see that as entirely possible for that period. Now, with proper clothing, motorized vehicles etc. I think people have gone to the geographic south pole, but Amundsen, nah, I don’t think so indeed. That is an interesting point about the Shackleton expedition. They might have staged the photos in a more accessible part of Antarctica, or even used multiple layers, which was possible in that era already. Take some photos of a snowy place and put the layer of actors in front of it. Film is a bit harder, but should be possible too. After all the film industry was already in place. The PTB could have just gone to northern Canada for their photo ops – who knows – perhaps even a Hollywood sound stage with fake styrofoam snow and icebergs, and fake, giant rubber inflatable whales and stuffed penguins. Remember, regarding the PTB, we are talking about cowards here, they’re not likely to risk their lives for anything. It must be like 25 years ago that I watched this. A tad off-topic but not really at the same time and good to add some fun. What are your thoughts on this “Amazing Journey to The Bottom of the World” by Ernie Shackleton and his mates? I’m certainly not making light of your research. This is an intriguing subject that I had never contemplated. In my youth I actually loved those old stories about how this brave adventurers discovered the farthest corners of the world. They have one thing in common. All the credibility of those stories is based on diaries they supposedly wrote on their journeys no matter the circumstances. Imagine you’re starving, thirsty, half frozen and death tired. Would you then care about writing a diary? Or if you decide to write, wouldn’t you lie a little to make you look good on it. Same thing with the gospels which were written more than 100 years after the Crucifixion and still are used to give credibility to a religion for like 2000 years now. History is a written thing. It exists only on paper (or similar media). Once you accept it can be entirely fake, what is there left? It’s just stories. It still can contain some morale, teach you some lessons. Give you directions. As every story does. The National Geographic Society seems to be charged with the job of making this stuff come alive. I’ve encountered them time and again … Waco, for instance. If they could not see through that farce, then they must be in on it. [Which reminds me of another slice of history that needs a closer look: the Lewis and Clark Expedition. It is the subject, of course, of a NG doco, and also a Ken Burns film series (I find his stuff unwatchable), and a best seller called Undaunted Courage by Stephen Ambrose (2001)]. the national state came into existence after the French Revolution. So the USA. In every country there are similar stories giving the citizens their heroes. People first learn this in schools. Those stories are not being told from one generation to the next like other stories. It’s part of the state propaganda and mostly invented. The school system also came into existence together with the national state. Before that, there were scholars and teachers of course but not many and not for many and everyone of them spreading his own version of knowledge. School systems as we know them are not to spread knowledge within masses but to create proper citizens. Only a small part of what we have to learn is knowledge. The most part is just information necessary for living within the state system. That’s why we need degrees. If you’re interested in more knowledge you have to learn it yourself. Just a quick glance, Lewis and Clark Expedition consisted of L and C and 3o men and one woman for a total of 33 … it is indeed worth a further look. As a German national you may not have heard of them, but in our American schooling we are all told about them and their heroics in exploring the North American continent looking for a water route to the west coast via the Missouri River. I notice on wiki that Shackleton was given the go ahead by Winston Churchill despite the outbreak of the First World War. The Battle of Falkland Islands was fought between the British and Imperial German Navy in 8th December 1914, southwest of the islands, I.E. near South Georgia and Elephant Islands. Shackleton departed from S. Georgia on the 5th December, was that a coincidence?